Three days after launch, a SpaceX Dragon cargo ship caught up with the International Space Station early Saturday, delivering more than 5,600 pounds of equipment and supplies, including fresh fruit and holiday treats. 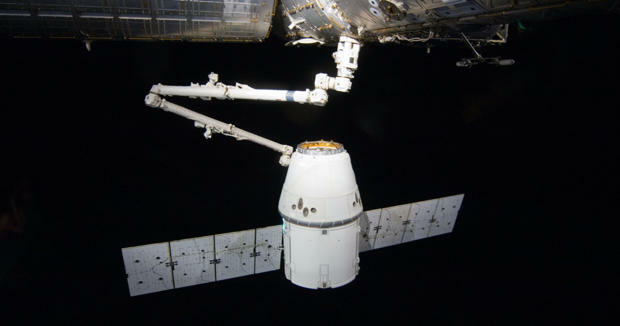 With the Dragon poised about 30 feet from the station, commander Alexander Gerst and Serena Auñón-Chancellor, operating the lab's robot arm, locked onto a grapple fixture on the side of the cargo ship at 7:21 a.m. ET (GMT-5) as the two spacecraft sailed 250 miles above New Guinea. Capture was delayed more than an hour because of problems on the ground that interrupted communications through one of NASA's tracking and data relay system satellites. Once the station moved within view of a different TDRS satellite, capture operations resumed and the Dragon was secured. Flight controllers at the Johnson Space Center then took over, operating the arm remotely to pull the cargo ship in for berthing at the Earth-facing port of the forward Harmony module. Motorized bolts were driven home about three hours after capture to firmly lock the ship in place. Loaded in the Dragon's pressurized compartment were 2,286 pounds of science gear, including a rodent habitat carrying 40 mice, 670 pounds of crew clothing and other supplies, 421 pounds of space station hardware, 88 pounds of computer equipment, 33 pounds of spacewalk tools and suit components and 24 pounds of gear carried up for the Russians. Mounted in the cargo ship's unpressurized "trunk" section was another 2,150 pounds of gear, including an experimental robotic refueling system and a laser instrument that will measure the height of forest canopies around the world. Both will be mounted outside the station. "We did fly some extra food, some Christmas-type food for the crew, standard things, candied yams, turkey, corn, green bean casserole, some Christmas traditional standard stuff like that," said Joel Montalbano, deputy program manager of the space station at the Johnson Space Center. "There's also some fresh fruit for the crew," Montalbano said. Once hatches are opened to the Dragon, the crew first will move high-priority science equipment and supplies into the station, including the rodent habitat and items that need to be transferred to the station's freezers. The Dragon launch Wednesday marked the ninth cargo flight launched to the space station this year and the third in less than two weeks following the arrival of a Russian Progress freighter Nov. 16 and a Northrop Grumman Cygnus spacecraft the next day. Overall, about 30 tons of supplies and equipment have been delivered to the outpost this year by three Progress spacecraft, three Dragons, two Cygnus cargo ships and one Japanese HTV.